Pasta tosses are a favorite around our house because they are simple, quick, and always delicious. You've already seen at least one pasta toss here, trains, planes, automobiles... and sausage?! ?, and I'm sure you'll see many more. Here are the basic building blocks for pasta tosses. Yup, betchya didn't see that one coming, did you? I like to use "spoonable" pastas, such as rotini, cut fusilli, penne or farfale, in these dishes. They mix better with other ingredients for that "all-flavors-in-one-spoonful" experience. We really like the Barilla Plus mulitgrain pastas 'round here. They are a bit sturdier than standard semolina-based pastas, and better for you, and they actually have some flavor. I used Barilla Plus penne this time out. Here's where the flavors begin... with your choice of onion, shallot, garlic, celery, carrot, etc. I usually start by dicing a medium-sized onion, and sweating it in olive oil with a pinch of kosher salt and a few grinds of black pepper. Towards the end of the sweat, I'll toss it some minced garlic. I toss it in late so that it doesn't burn. There is almost ALWAYS pasta toss-friendly meat frozen safely in our freezer. Chicken is our main staple, but we also have used sausage, and in some cases, we've left out the meat completely, and used portobellos. 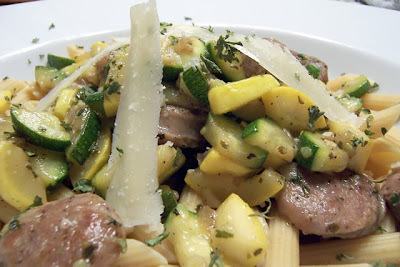 For the dish (photo) above, I found three links of the pre-cooked Italian sausage leftover from an earlier pasta toss. I bias-sliced it, and added it to the onion and garlic to brown up. Sorry, Mom always said to eat our veggies, so in they go. In the Summer months, we like to hit the local farm market for fresh zucchini, squash and tomatoes, but canned diced tomatoes and frozen green beans, spinach, broccoli, peas, cauliflower and the like, are terrific and easy to keep on hand. I was lucky to find some young zucchini and yellow squash at our local grocery store (a bit surprised to find nice ones in November), so I had to go with them. To save some cook-down time, I coarse diced them, put them on a microwave-safe bowl, covered them and nuked them for about one minute on high to soften them. I then gave them a quick stir and nuked them for an additional minute. These then went into the skillet with the aromatics and browned sausage and little bit black pepper. Here's where you pull out your herbs and spices, either fresh, or dried. When we plan ahead, we try to get fresh herbs, but in most cases, I'm punting, so dried herbs work great. Parsley, basil, thyme, oregano, dill, chives, etc. are all great additions. I went simple, and only used dried parsley and oregano, but I added it along with the veggies to give it a bit of time to rehydrate. Time to go for the "Ooooo" factor. Maybe it's a chiffonade of fresh basil, a few grinds of coarse black pepper, a shake of red pepper flakes, a big honkin' spoonful of feta, a drizzle of extra virgin olive oil, a bit of lemon or lime juice, a splash of balsamic vinegar... or in this case, a few shavings of peccorino romano. Whatever you choose, it'll help put your dish over the top. One great thing about pasta tosses is that it is pure creativity with simple ingredients. And the creative part, well, that's where the fun is. Don't be afraid to try something new and unique. If you like a particular combination, scribble it down in your recipe file (future post), and share it with friends... or food bloggers. If you were less than thrilled, think of what you would change to make it an awesome dish of your own. One quick pasta toss we like to have in the summer here is a BLT pasta. I usually use baby spinach for the "L" and love when there are fresh sweet cherry or grape tomatoes for the "T". then I just cut them in half rather than cubing them. The only cooking is the pasta, and a 'spoonable' pasta like you recommended is best. We garnish with some wonderful olive oil and that coarse black pepper. If we have fresh parsley or basil around, they always get added. Pasta is a wonderful comfort food!